When it comes to advertising, we know people search for services and read reviews online, but this doesn’t mean that you should ignore more traditional methods of advertising. 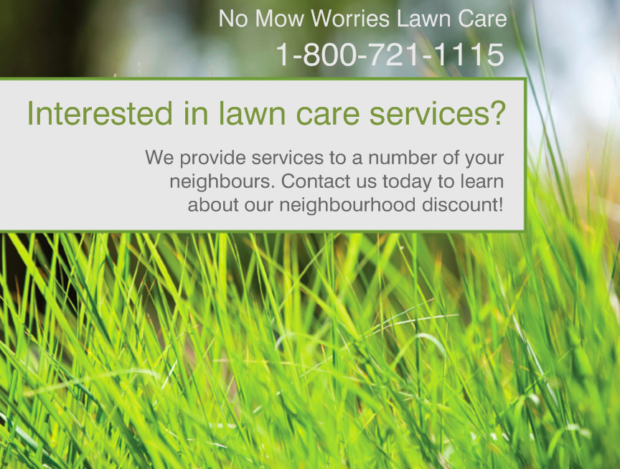 Distributing and delivering flyers is one of the most tried and tested ways that lawn care companies advertise. 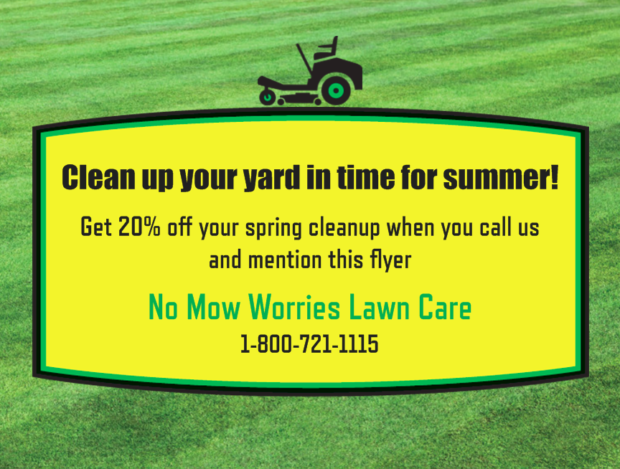 Advertising with lawn care flyers is an attractive low-risk way to promote your company. You can get professional flyers designed and delivered to your home or business address at a very low cost and, in terms of distributing the flyers, you can deliver the flyers yourself. Before you get started, be sure to check with your local post office to see what sort of laws are in place in regards to unsolicited mail. In some areas it is illegal to deliver promotional materials or you may require a permit. While printing and distributing flyers is a low-cost way of promoting your company, there is no silver bullet in any sort of advertising. You should be prepared to learn from any advertising campaign and then take those learnings and adjust future campaigns. Because there are no guarantees in advertising, make sure you start with a budget you feel comfortable with. If your initial set of flyers brings you a lot of new business, you can always invest more at a later time. On the flip side, if you find that you’re flyers don’t bring you new business, you can cut your losses early. If you’re tracking the success of delivering flyers, you can make better advertising decisions in the future. Start simple when it comes to tracking: you can always ask customers how they heard about your business when they phone you. If you’d like to take your tracking to the next level, you can create a coupon or discount that is exclusive to people that receive the flyer. You can then keep track of how many flyer discounts are redeemed. You’ll need a place to keep track of all this information. We recommend using a CRM so you can track all your client information in one place. So with a good understanding of these 3 guidelines, it’s time to get started! What should be on your lawn care flyers? When it comes to advertising, you don’t want to bombard the reader with more information than they need. An effective flyer doesn’t need to be complicated. You want to keep things simple and make it easy for potential customers to contact you. This one is obvious, but it’s important. The point of your flyer is to introduce your company to prospective customers. Make sure that you include your company name and, if possible, include your company logo on your flyers. For your customer to take action on your flyer, they need to be able to contact you. Your flyer should contain your phone number and URL if you have a website. Communicate your service offerings. Are you using this flyer to promote a special spring cleanup? Are you delivering this flyer mid-season and promoting all services? Whatever service you are promoting, make sure that your flyer has enough space to handle all your marketing copy. You don’t want to have an in-depth explanation of all your services if the flyer itself is really small. Alternatively, if there is room on your flyer, you can go into your services in more detail. Just remember that simple is good—don’t make the copy longer than it needs to be. At this point, the reader knows what you’re offering so you should provide an incentive as to why they should choose your business. The incentive can take many forms: maybe it’s a discount on their first service or maybe it’s the fact that you are locally owned and have been servicing the area for a number of years. What action do you want readers of your flyer to take? Do you want them to call and book your services? Visit your website and request a quote? Make sure that is clearly communicated on your flyer. How do you get your flyers designed and printed? If you’re running a lawn care company, there’s a good chance you aren’t a professional designer—that’s okay! There are a number of ways to get inexpensive flyers designed that will meet your needs. For design, you can try an online marketplace like Fiverr. Fiverr is the world’s largest marketplace for digital services. You can shop different flyer designs starting at $5. How do you distribute your flyers? If you deliver yourself, door-to-door delivery is an easy and free way to distribute your flyers to a particular neighborhood. This helps you create some brand awareness in a particular community and it gives you the opportunity to talk to home owners as you are in the neighborhood. Be sure to check with your local post office to see what sort of laws are in place in regards to unsolicited mail. In some areas it is illegal to deliver promotional materials. You’re already in the neighborhood, so it’s easy to take a few minutes to promote the business. Also, having clients in the same neighborhood is a great way to add new business without adding a lot of driving time. Once the job is complete, there is opportunity for you to engage with this customer for more business. Leave behind a flyer at your client’s home to promote additional services or packages. You can also let your customers know about your referral program, so they can save money off of future jobs. These leave behind flyers can be combined with customer service follow-up emails as a great way to stay top of mind with your customers. In today’s digital age, delivering flyers is a less common advertising tactic, but its low cost makes it an attractive advertising option. Remember to always track and learn from any advertising efforts. Looking for more ideas on how to promote your lawn care business? Check out Jobber Academy’s articles on setting up your online presence and how to get free website traffic through Google.